It looks like those power/telegraph poles don’t have wires yet. Ikuta-mae, the street leading to the shinto shrine Ikuta Jinja. In the background the shrine’s torii can be seen. One Western style building made of stone stands out among the otherwise traditional wooden architecture. When Kobe opened its port for trade in 1868 (Meiji 1), this was a beautiful rural sand-road that lead from the shrine to the sea and was lined on both sides with plum and cherry trees and countless stone lanterns. The Dutch located their first consulate around here on the left side of the road. The consul must have had an incredibly beautiful view in spring when all those trees were in flower. The trees and lanterns, however, were removed in the 1870s and the country road became a bustling shopping street that connected Ikuta Jinja with the Foreign Settlement. Detail of the image above, the torii is clearly visible. Since this photo was taken in the early 1900s the area has undergone a complete transformation. 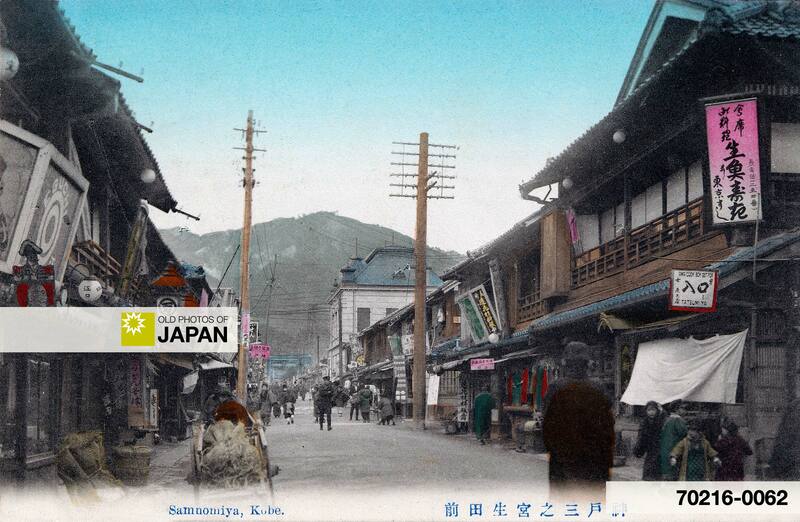 Any person stepping out of this vintage postcard into today’s Sannomiya would be absolutely unable to recognize anything. Even Ikuta Jinja looks different. For a brief history of Kobe read Kobe 1880s • View from Yamate. 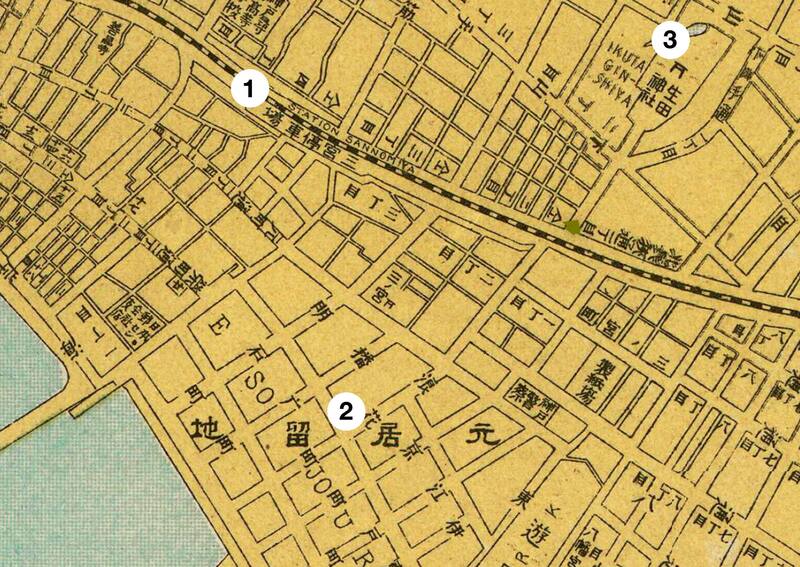 1929 (Showa 4) Map of Kobe: 1. Hyogo Kencho; 2. Sannomiya Station (Still in its old location. It was moved to its current location on October 10, 1931. The old Sannomiya Station was reopened in 1934 as Motomachi Station. ); 3. Motomachi-dori; 4. Sannomiya Jinja; 5. Ikuta Jinja. You can also licence this image online: 70216-0062 @ MeijiShowa.com. Yes, it does look like that. I hadn’t noticed that yet. Could have been the way the light was reflected, because they were certainly there in the early 1900s when this photo was taken.